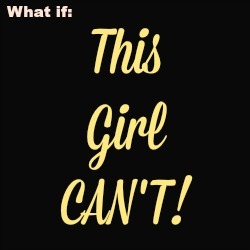 Ojo's World: But......Maybe this girl can't!? I'm sorry. I know this is the wrong time of the year to be feeling a bit negative, but I can't help it! I've always been the 'New Year, New Me' type. For years I made resolutions, and very often kept them. Then gradually I noticed that nothing really changes, not really. This year, I've realised that my life is a bit like a book. Each year is a turn of the page. All the previous pages are still there, you are telling the same story, just using some new words. I'm tired of this story though! I've spent years looking after my health. I watch what I eat. I don't exercise enough, but a lot more than most. Yes, I like chocolate, but I don't indulge often. Yet last year: My diabetes didn't improve, my blood pressure didn't change much, neither did my cholesterol! Also last year: I discovered I have Vitamin D deficiency, and very low iron. I also realised that if I cut out dairy, my stomach feels better, so I most likely have an intolerance to lactose. I'm probably the fittest I've ever been, but that's it! That's only because I have fallen in love with Zumba. What if I am the girl that will always fail? I get inundated with advice, but I've tried it all before. I'm doing the 'no carbs after 5' again, from today. Not because I think it will help me lose weight, but because I realised I slept better when I did. I'm tired of setting goals. I don't want to be the lead character in this stupid book anymore.